Custom pillow boxes are used for many different purposes; people love to use them to give gifts because they look amazingly different from another type of boxes. From jewellery to perfumes to garments, small and big-sized customized pillow boxes are used in many different ways. They are used because of their festive looks and their usability. These two reasons make them the best sort of boxes among different type of businesses and vendors. They get picked up quickly because of their different looks. There is a reason why a lot of businesses are now moving forward to packing their items in custom-made pillow boxes. Custom made pillow boxes can be clear or see-through, or they can be made with materials like Kraft. They can be used such purposes such as promotional campaigns or special occasions such as Christmas. Pillow boxes as a favor or gift are also very popular. Why Get Custom Pillow Boxes? To be fair enough, you can perfectly go with picking up pre-made pillow boxes from any packaging company of your choice; you can paste your company's stickers and labels on them, pack your goods and dispatch them to retail stores. This will save money, but while you will be saving money, you will be losing a lot. Custom pillow boxes are not just the pillow boxes made for everyone or every company; they are tailored to your specific needs and your branding philosophy. What you get is not a cheap looking sticker pasted on a randomly and pre-made pillow box, but your company name, logo, tagline and product name, an image printed on the box. 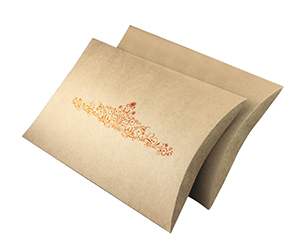 These custom printed pillow boxes will make your product stand out from the crowd and give strength to your brand. Now that is something you cannot accomplish by those hastily done and cheaply available premade boxes. Customization for the pillow boxes can be done in any color such as red, brown, black, white and many others. The liberty of sizes from small to large pillow boxes can be obtained effectively. These freedoms are usually unavailable in DIY pillow boxes. What is in a Personalized Pillow Box? Personalized pillow boxes are different from randomly picked premade pillow boxes in many different ways. They are called custom pillow boxes for some easily understandable reasons. Let us consider the materials first; with custom-made pillow boxes, you get many different types of materials to choose from, e.g. corrugated fiberboard, Kraft, plain cardboard material and Bux Board etc. Then it trickles down to the structure of the pillow box. You can either get the traditional pillow box with both rights and left sides made to be opened and closed in a certain way and the vertical lengths rolled over and pasted on each other for perfect grip, or you can get the customizations like strings or buttons etc. 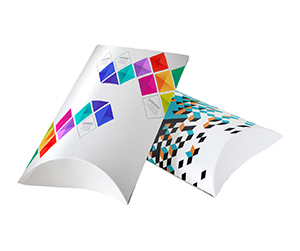 We offer two color models, CMYK and Pantone. Among design and finish options we offer a lot of different options for your specific needs. These options include, but they are not limited to, custom die cut window pane, gold or silver foiling, gloss or matte finish, raised ink, debossing, embossing, PVC sheet and perforation etc. Moreover, all these custom pillow boxes can be bought in wholesale, because pillow boxes bought in bulk can be very cost effective. Why Get Customized Pillow Boxes from PackagingBlue.Com? PackagingBlue.Com offers customized pillow boxes as many other quality companies do, but here is why we believe that you should choose us and no other company. Affordable Pricing - As compared to other packaging companies our prices are only very competitive and affordable. Free Shipping - We do not apply any hidden charges including shipping charges. We ship free of cost. Professional Offset Printing - What makes the difference in today’s business ecosystem is getting things done professionally. With professional packaging experts and engineers on board, PackagingBlue.Com offers 100% professional offset printing. Fast Turnaround Time - Our turnaround time is the fastest – we ship your order to your doorstep within 3 to 4 business days. Customer & Sales Support - We have customer and sales support teams to help you through pre-sale, while-sale and post-sale support. This is how you get exactly what you ask for . We use 100% ecofriendly packaging materials. Our materials found in paper pillow boxes or cardboard pillow boxes are fully biodegradable, and they pose no harm to kids or cruelty to animals.